Have you ever toyed with the idea of doing a juice cleanse? Maybe you thought it could be good for your gut? Maybe it could help you shed some pounds quickly? Or maybe you were just curious and wanted to be more like Gwyneth Paltrow? Haha no matter what your reason, I think most of us have at least thought about doing one. But thinking about it and actually doing it are totally different… so I decided to test it out for you! Now, let me give you some backstory. Honestly, if you asked me my thoughts on a juice cleanse before this experience, I probably wouldn’t have recommended it. I always thought that it was basically starving yourself… not to mention, it seemed REALLY hard ? 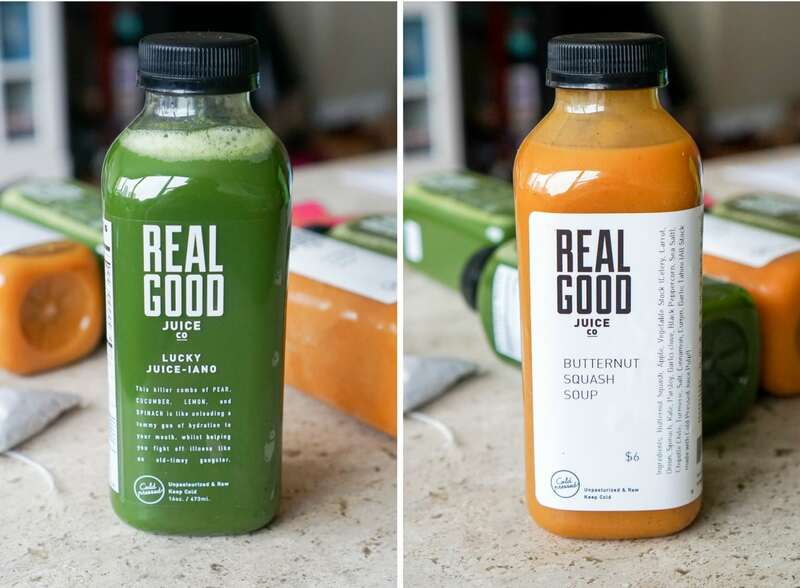 But last month, my friends at Real Good Juice Co reached out to tell me about their new Winter Cleanse and I realized it might be a good idea to test it out myself, so I can speak from experience to you guys! But wait – what’s a winter cleanse? Good question! Basically, Real Good added soups with ingredients like butternut squash, chickpeas, and tomatoes to bulk up and warm up their cleanse. I really think that this addition is what kept me from feeling hungry over those 3 days. Obviously, VERY much appreciated, but also super super smart. They know what they’re doing over there. Is their Winter Soup and Juice Cleanse for you? After completing my own, I still don’t think that I have any authority to tell you that you should or shouldn’t try a juice cleanse. All I can do is tell you about my experience, right? Let’s dive in. I really wasn’t as hungry as I thought I was going to be! There is a LOT to drink throughout the day. Turns out a cup of Rooibos Tea, 4 juices, and 2 soups keeps your stomach pretty full! I definitely missed chewing, but my stomach wasn’t grumbling and I never felt like I was going to pass out… which are 2 stereotypes I assumed would happen to me. Not the case! Okay, the Juice Springsteen is very green and kind of hard to get down… but everything ELSE is delicious! ? 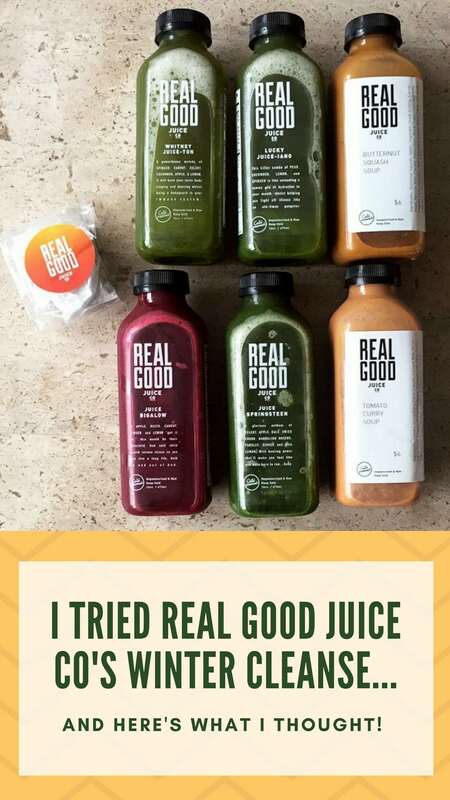 I was already a fan of Real Good because I go to pick up a smoothie or juice here and there all the time anyway. But after doing this cleanse, I especially loved the Lucky Juice-iano, Butternut Squash Soup, and Juice Bigalow. Oh, and on Day 2, I got to have a bottle of their creamy almond and hazelnut milk (Juicy Liu) and it was literally heaven. SO GOOD. Because I am constantly juggling so much and working well into the night, I sometimes have trouble sleeping. Not during the cleanse though! I’m assuming the lack of caffeine played a part in this, but regardless, I was out as soon as I hit the pillow each night. And I woke up on Day 3 feeling more rested than I have in ages. Such a win! You know when you just can’t kick that bloated feeling? Yeah, during this cleanse, it was completely gone. Like magic. It totally made me remember how much better I felt when I was more dedicated to a plant-based/almost-vegetarian diet. Pretty sure this was the inspiration I needed to make some changes moving forward! …but probably not surprising. On a juice cleanse, you have to pee a LOT. At least I had to! I spent about 5 hours in the office on Day 1, and in that short time, I was already worried about how many times I was going to need to leave a meeting to go to the bathroom. This might be TMI, but I also think it’s something you should know before starting! I definitely had low energy. This one seems obvious, right? I am a firm believer that food is fuel, so if you need to train/work out or get through long stressful work days, a cleanse probably isn’t for you. One of the reasons I liked it was because it forced me to slow down, but not everyone has that option. Take a look at your schedule and what is being asked of you, and that should help make your decision for you. I felt like I was doing something good for my insides. I know a lot of people will want to know how many pounds I lost, but I didn’t step on the scale for a reason. After trying it myself, I really don’t think weight loss is the reason to do this. 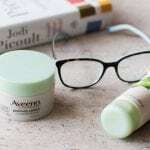 Instead, I kept thinking “I feel like I’m doing something good for my insides.” We ask so much of our bodies all the time, that it felt good to give it a break and just give it the good stuff for a few days. No crap processed foods, no meat, no dairy, none of that. It really felt like I was giving my body permission to reset. Once I finished the cleanse and ate solid foods again, I felt amazing! I even went to a Flybarre class the morning after – and I felt great. But for those of you wondering, would I do it again? I’m really not sure. 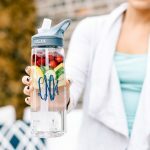 I honestly think I’d be more likely to do a one day cleanse (Real Good offers them for $55) because it would give me a quick reset without the full time commitment. But then again, if I ever felt like my body could really use that reset again… never say never! If you’ve read all of my observations above and you still think it’s for you, I say GO FOR IT! You can order your Winter Cleanse on their site here, but don’t forget to enter the code REALGOODLSL for 10% off! Do you have any additional questions? Comment below and I’ll get back to you as quickly as I can!! *I received this cleanse for free, but I decided to write this blog post about my experience completely on my own! All opinions are (as always) 100% my own! The Lake Shore Lady Smoothie at Real Good Juice Co! « I found the best (budget-friendly) over the knee boots for petites!